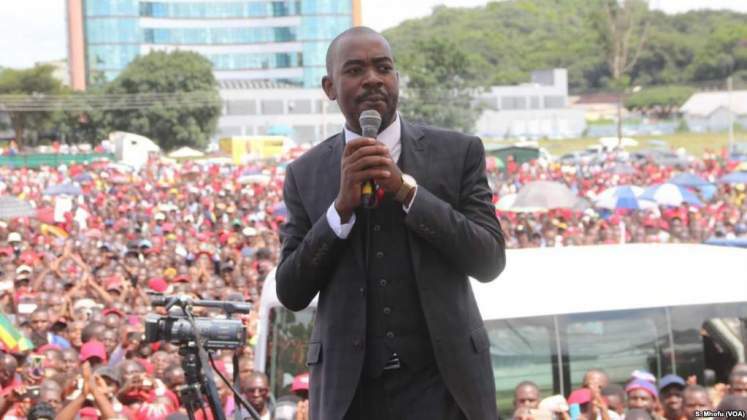 MDC-Alliance presidential candidate, Mr Nelson Chamisa, yesterday threatened to usurp the powers of the Zimbabwe Electoral Commission and breach the Electoral Act by unilaterally announcing results of the July 30 harmonised elections. Further, Mr Chamisa said his party had Germany scientists whom they wanted to do "forensic testing of the every ballot paper to be used in the election". The alliance yesterday staged its second demonstration in Harare against Zec but dramatically trimmed its litany of demands from 10 to two, without giving any explanation. Addressing party supporters who gathered for the demonstration at Africa Unity Square, Mr Chamisa said he was ready to break the Electoral Law by announcing the election results before Zec could do so. "After voting, we will converge at a place and announce the election (results) to you. We are going to tell you the election results because we do not trust Zec to announce accurate results. It is us who are going to announce and we have set up the machinery in here and outside the country to tabulate the results," he said. Mr Tendai Biti, then MDC-T secretary general, was arrested in 2008 for announcing unofficial presidential results in which he claimed the late Mr Morgan Tsvangirai had won by 50,3 percent to obviate a run-off. Mr Tsvangirai resoundingly lost the run-off. Mr Chamisa claimed Government had brought in Russians to assist Zanu-PF to win the polls but his party would counter that using German scientists. Prior to that, Mr Chamisa — who conflated Zec and Zanu-PF throughout his speech — had told his party supporters that the sovereignty of the country did not allow foreigners to interfere in the management of elections. "They (Zec and Zanu-PF) want to change the ballot paper," he said. "Right now they have Russians. I am being told by insiders and soldiers. I am watching them and if they are helping Zanu-PF on elections then we have an issue with that. Sovereignty of the country doesn't allow to have foreigners coming to interfere with our electoral processes. We are taking up that matter and we are not going to budge." Zanu-PF spokesperson, Simon Khaya Moyo said of the alleged Russians: "Can he (Mr Chamisa) name them to authenticate his usual dreams?" "We had 10 demands but we have decided to shelve the other demands because they don't matter," he said. "He has moved from infinity grievances against Zec down to two," he said. "We expect his next demonstration will be over grievance number zero." Mr Chamisa threatened make Zimbabwe ungovernable if the alliance's demands were not met. "We are now assessing the situation and after dialogue with Zec this week, if there is no movement, we will not sleep," he said. He claimed they had approached the United Nations, the African Union and Sadc to lodge their grievances. "We took up the matter with them and if they don't respond, we will become our own answer," he said. "To become our own answer means we will take the fight to the end." Contrary to his claims, diplomats this week said he had failed to make inroads in Sadc and the AU as no leader gave him an ear. The only person he has connected with successfully is Kenya's opposition leader, Mr Raila Odinga. Mr Chamisa said the Zimbabwe Defence Forces led by their Commander General Phillip Valerio Sibanda should know that he would be leading the country after July 30. "When we go for Heroes' Day celebrations, they should know that they would have a new leader and he should be respected," he said.